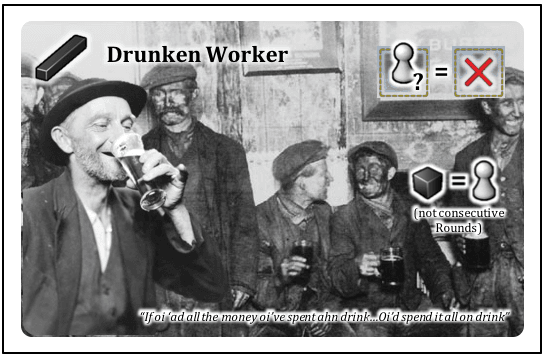 What shall we do with a drunken worker? Excavate the path to Hebron station. Excavate the path to Halfway station. Excavate the path to Clogwyn station. Dynamite the Jungfrau while it’s snowing. Dynamite the Jungfrau while it’s blowing. Filling in canals and picking flowers. Filling in canals for hours and hours. Slide 'im down The Cog on the Devil’s Shingles. Slide 'im down The Cog till his buttocks tingle. Bury his Surveyor with a nice, big headstone. Bury his Surveyor coz he's nice and dead, Tone. Tunnel under water till he gets to Sangatte. Tunnel under water in his sturdy mine hat. Back to the Pub for a right old skinful. Can't go t'church coz he's much too sinful. 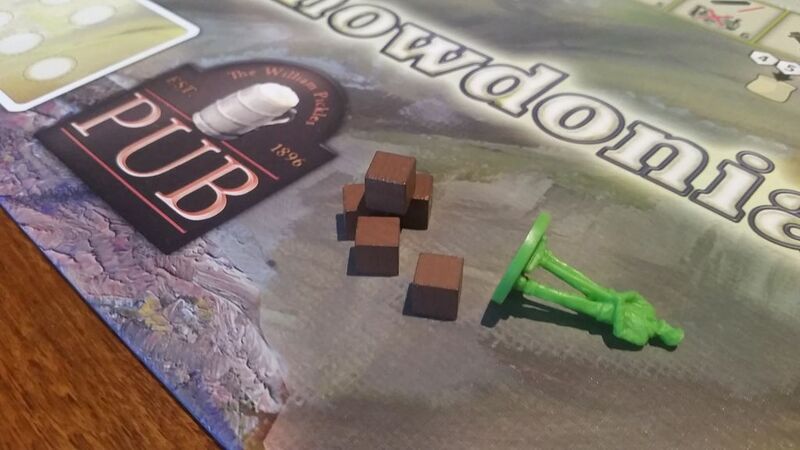 When you place your 3rd (Pub) worker, place him with a game marker disc underneath. When you return your 3rd worker to the Pub, leave the disc in the action space for the next round: the space cannot be taken by any player during that round. Your worker cannot come out during the next round (because he is 'sleeping it off' on that action space!). At the end of that subsequent round, remove the disc from the space - it is available for the next round (as is your sobered-up 3rd worker)!